Can I fit a Holodeck in my home? The first time I tried out the HTC Vive back at EGX 2015, I was absolutely blown away by the leap in gaming technology it presented. I spent half an hour painting in thin air, helping land aircraft safely, reeling back from stunningly high drops and not caring that I looked like an idiot to the rest of the world. I lost track of where and when I was, instead focusing on a new kind of immersive gaming experience. The first shock came when I had to take the headset off and remind myself everything had been virtual. The second shock came when I tried to imagine making this work in my own home. Six months later, I finally have an HTC Vive in the Destructoid UK offices. While I maintain that the Vive presents a huge leap forward in gaming and general PC usage, the truth remains that space is going to be a big factor at play for many gamers. 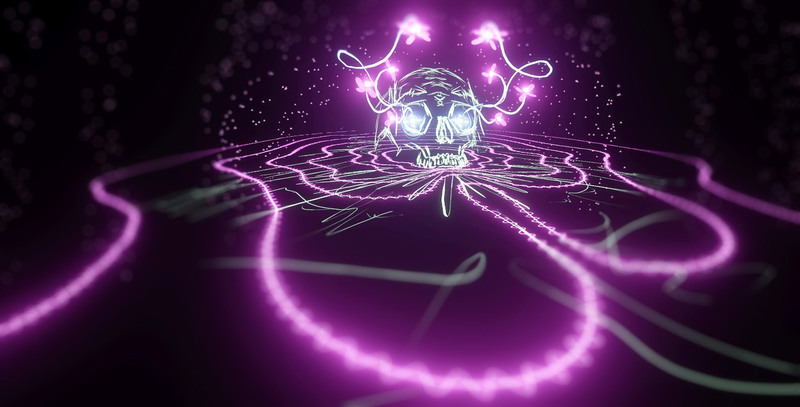 If you've got limited space to play, you're going to notice some of the most interesting Vive experiences being held tantalisingly just out of your reach. If you have the space for it, for my money, the HTC Vive blows the Oculus out the water as a long term investment. When the HTC Vive turns up at your door, the box includes the VR headset itself, a pair of small base stations for tracking, a set of wall mounts, two motion controllers, a link box that receives wireless data and connects the headset to your PC, an alternative extra face cushion and a whole bunch of assorted cables for setting up the Vive. 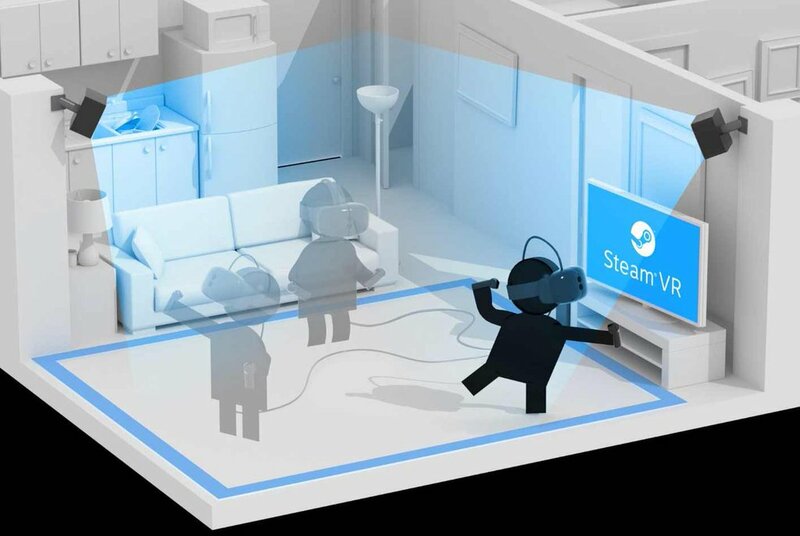 Where the Oculus has a single sensor that can be placed between yourself and your monitor, the Vive requires its two base stations to be pointed down at you from alternate corners of your ceiling. While the box comes with a set of wall mounts, I instead opted to use a pair of cheap lighting stands to increase the portability of my setup between rooms. While setup of the Vive was not overly complex, it was a step or two more complicated than setting up the retail Oculus. The base stations in each corner of your room need plugging into the mains, but connect wirelessly once powered. The motion controllers also connect wirelessly, with USB chargers provided for when they run low on juice. The headset itself needs plugging first into the provided link box, then from there into the PC via an HDMI cable and a USB cable. While setting up the cables was fairly simple, my PC took a little bit of fiddling around before it would recognise the headset, controllers and base stations. When disconnecting the hardware to move between rooms, later setups were faster. The day the headset arrived in the Destructoid UK offices, I wore it for pretty much eight hours straight with minimal discomfort. The headset itself was lightweight and comfortable enough to wear for long periods of time, and I did not feature any greater eye strain than I already experience working at a monitor all day. 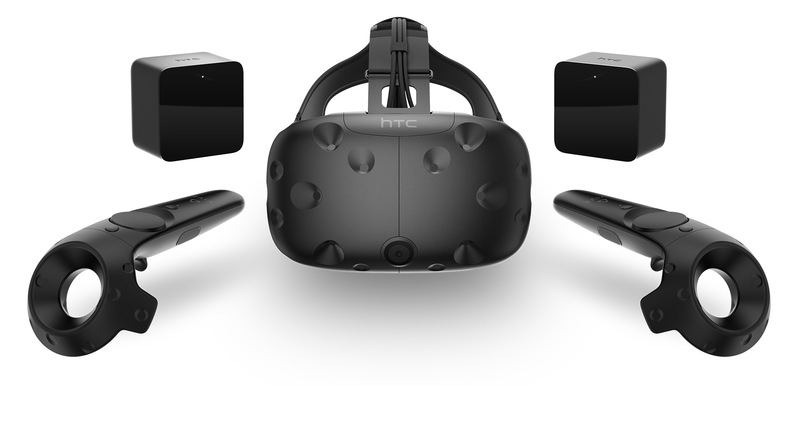 While the Oculus ships with a pair of headphones built onto the headset, the Vive does not. Hooking up a pair of headphones is easy, but putting your headphones on the correct ears while your eyes are covered can be a little more tricky. Getting headphones onto the right ears is important for directional audio matching visuals. The general build quality of the headset, alongside the motion controllers, feels incredibly solid. I feel like I could fall flat on my face or punch a wall without risking damaging the Vive. I might injure myself, but the Vive would likely come out unscathed from collisions. In terms of raw tech specs, the Vive has a resolution of 1200x1080 per eye, with a 90Hz refresh rate. The headset and motion controllers movements are tracked by the base stations in the corners of the room, and track in perfect 1:1. I never for a moment had a single issue with the tracking of my head or hands in virtual reality. The Vive also features a decent resolution camera on the front, which can be used at any time to provide a camera feed of the real world within the virtual environment. That's a really nice touch, particularly if attempting to do tasks like typing while wearing the headset. The bundled controllers, as well as being able to track movement in 1:1 detail, feature a trigger on the base, a track pad meets clickable button on the top, and a pair of grip buttons on the sides for sensing gripping sensations. The Vive features 15-foot cables, ensuring that you should have no concerns about having to move away from your PC. 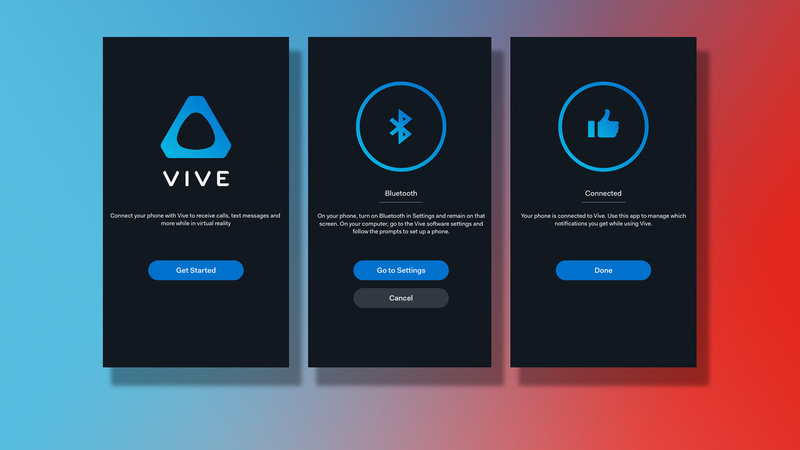 While the Oculus has its own dedicated storefront app, the Vive is heavily twinned with to Steam for accessing games. There are almost 100 Vive compatible games available on Steam on launch day, with almost another 100 games and apps available outside of Steam with Vive support built in at launch. While many of these are ports of older software or do not support room-scale features, this is still an impressive number when placed next to the 30 launch titles for Oculus. Being able to save to somewhere other than your default directory at launch is also a big plus for those running a small solid state drive for their operating system. While most of my software reviews will be coming in the coming days, I can safely say that, at launch, the software available for the Vive covers a wide variety of use cases, tastes and setups. From watching short films about butts to 3D sculpting apps, cockpit based simulations and virtual desktop environments, I am very impressed with the launch lineup for the HTC Vive. 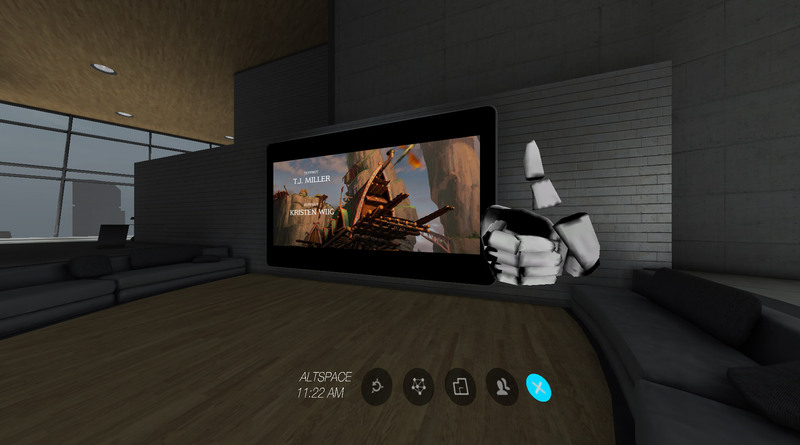 The Steam VR interface for switching between software is polished in presentation and form, with a particular highlight being the ability to view the real world through a camera feed from the headset at any time. The Vive ships with download codes for Tilt Brush, Fantastic Contraption and Job Simulator, which will all be reviewed on Destructoid very soon. Room Scale VR right now is the big selling point for the HTC Vive over the Oculus or PSVR. Put simply, it's the ability to clear a physical space, set up an equally sized virtual rectangle, and walk around inside VR environments. Rather than the Oculus whose experiences are all static, room scale experiences turn VR to something more akin to the Star Trek Holodeck when done correctly. Simply walk around your room to walk around in the game world, use your hands to grip, throw, touch and interact with the world. Inhabit a virtual 3D space. Let's start by talking about the positives. When Room Scale VR works, it is a real game changer for immersion in video games. It's hard to explain without trying it for yourself, but simply walking around in a game by actually walking and interacting with objects by reaching out and grabbing them makes an incredible difference to immersion in virtual worlds. Combine the naturalistic methods of interacting with the world with a gaming setup that isolates you from your senses of changing natural light and passing time, you've got a recipe for impressive gaming sessions. 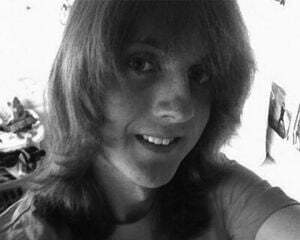 I found myself multitasking far less, focusing on my gaming far more, and losing hours without realising as I explored worlds that did not really exist. Room scale VR is the future of gaming, if it works for you. The biggest issue with room scale VR is physical space restrictions. I initially set up the Vive in my office, where my main gaming rig lives, and was just about able to get room scale VR working. You initially set up your room by tracing the outline of your available space with a motion controller, and I had to rearrange my office a couple of times before I found enough space Valve would let me wander around in. While I technically had enough space to play room-scale VR at the minimum recommended space requirements, I was constantly reminded of the limits of my available space by the ever present floating blue laser grid walls that told me not to go any further in a given direction. These barriers being ever present felt constricting, and far less freeing than playing room scale experiences in demo environments. I later moved my setup, including gaming rig, from my office down to my living room. A coffee table moved into the adjoining kitchen and I had far more room to work with, being able to wander around more before my limitations were made clear. 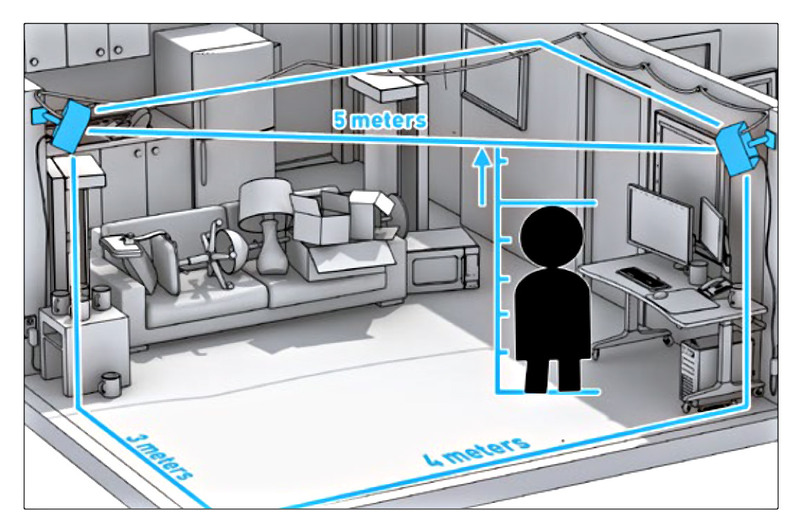 You really want a living room, emptied of clutter, to use room scale tech properly. The best room scale experiences I tried in the run up to launch included Budget Cuts, a demo in which you warp around environments using a special gun and throw knives at robots to get a job, as well as Tilt Brush, an application which let me create 3D art in real time. As someone who struggles with 2D art, I found 3D exploration a really intuitive way to map out physical 3D models. I would love to see room scale Vive support added to one of the big 3D modelling tools in the future, as it's an incredibly intuitive way to make 3D model sketches. As well as barrier walls appearing at the edges of your safe movement space, you can at any time look out the headset video camera to get a feel for where you are in your room. You can also, with varying success, set the headset camera to assess physical objects in the room and add them to your world as laser grid outlines. Interestingly, having your physical controllers replicated perfectly in 3D virtual space makes for some very odd sensations. The ability to find and pick up your controllers with the headset already on is cool, but forgetting you can't put your controllers down on a virtual table is a weird disconnect to get used to. More than once the combination of physical and digital controllers means I forgot some surfaces would not support physical weight. Room scale VR is amazing, but does ideally need you to make space in your life to accommodate it. Having a Holodeck in your home doesn't come without it's drawbacks. While seated Vive experiences are more common than those making use of room scale functions, I found them much easier to fit into my day to day life. 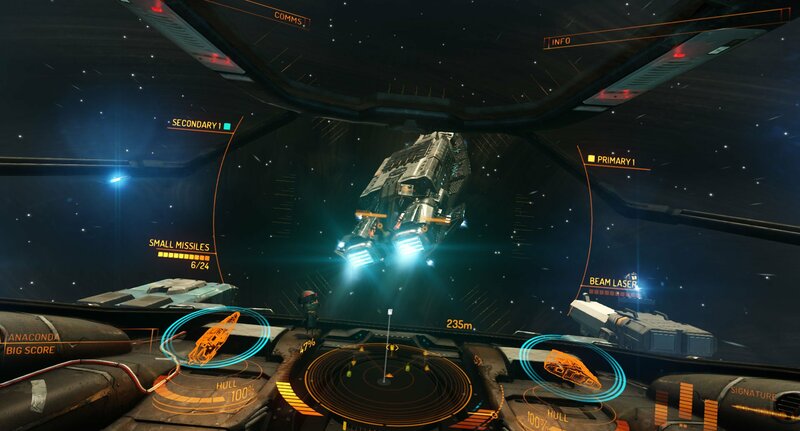 Still requiring the pair of base stations for tracking, I found my head tracking to be equally as responsive as when enjoying room scale experiences. From my time with both headsets, the Vive feels more comfortable, and is better integrated with my existing PC ecosystem. While the ability to play my non VR games on a giant virtual screen was cool, there are apps at launch available with more options available than Steam's Virtual Theatre offers. The ability to see your keyboard and mouse via camera feed without taking my headset off, as well as the absence of Oculus weird nose gap, for me made the Vive a considerably better VR platform of choice for seated play. While not heavily promoted, the motion controllers can still be used during a number of static, seated experiences. The only problem? The knowledge I'm wearing the headset but not making use of room scale features. That thought crept into my mind during a number of different games. As amazing as the room scale experiences offered for the Vive are, over the past two weeks they have failed to find a convenient spot in my regular routine. I have to make a specific effort to move my gaming setup downstairs, into a communal area, in order to play those experiences. Doing that just isn't a natural part of my life yet. If I had a bigger office by a couple of feet I would probably make more use of room scale VR, but for now it's something I have to make a special effort in my own life to enjoy. When it comes to seated experiences, I have been using the Vive pretty much non stop, and at the very least daily, since it arrived. I've watched movies on a giant virtual cinema screen, I've played video games for review while wearing the headset, I have played games in VR and just used VR as my general PC interface. It can take a fair amount of getting used to VR, being forced to focus on one task at a time rather than multi-tasking doesn't come naturally to people of a certain generation like myself, but it has found a nice spot in my life for when I want to focus on gaming, and need to make sure I don't get distracted from the art in front of me. While the near $800 price tag on the Vive is going to be an incredibly tough pill to swallow for most consumers, I have no doubt in my mind that VR tech is at the point where it's ready to be technically feasible, universally impressive and long lasting in appeal. I've used the Vive for the better part of two weeks now as a daily part of my routine and I've not once experienced motion sickness, fatigue or eye strain. I have instead experienced gaming in a form that's more exciting than anything else I have played in some time. I've used it for work, for gaming, for movies and for everything in between. VR is here, and I have been sold as a believer. While the Oculus is a very strong VR headset, the Vive feels like it's in a league of its own comparatively. The big sticking issue is how the market reacts to the price long term, and if development of new games maintains a consistent pace.